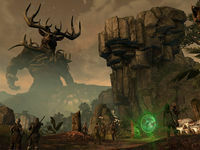 Conquer the March of Sacrifices and emerge victorious in the Great Hunt. The Ashlander Hanu has recruited me to join her hunting team within Hircine's Hunting Grounds. We must hunt down an indrik and present its heart to Hircine in order for Hanu to win a boon from the Daedric Prince and save her father. Hircine's Great Hunt has begun. I should explore Bloodscent Pass and attempt to find the indrik. A group of murderous Wyrd Sisters block my path. I'll need to defeat them if I hope to continue the Great Hunt. With the Wyrd Sisters defeated, I can continue my hunt for the indrik. I should move further in Bloodscent Pass. I've become trapped in a hole with a powerful spriggan. I must defeat it if I'm to continue the Great Hunt. With the spriggan defeated, I can continue the Great Hunt with Hanu. I should explore the Wispwood and see if I can pick up the indrik's trail. The indrik Tarcyr has killed a group of Nords and now uses their corpse to protect itself. I must defeat these thralls if I'm to hunt down the indrik. Now that I've defeated Tarcyr's thralls, it's time to hunt down the creature itself. I should follow the wisp that Hanu's father gave us in order to find the indrik. I've finally found the indrik and am ready to conclude the Great Hunt. I must defeat it if I'm to collect its heart. I have defeated Tarcyr and Hanu has collected the creature's heart. I should accompany her to Hircine. 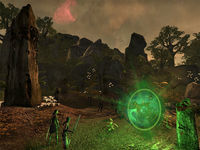 Balorgh has killed Hanu and stolen the indrik heart in order to win Hircine's boon. I should hunt him down and prevent this from happening. Hircine has refused to give Balorgh a boon, since he did not kill the indrik. Balorgh has sworn to kill the ones who did hunt the indrik, my companions and I. I should defend myself. Finishes quest I should speak to Hanu in March of Sacrifices. This page was last modified on 2 October 2018, at 16:39.